Lava Hot Springs features 4 large gravel bottomed, cement-walled pools. This gets a little confusing, but I'll try to be as clear as possible. 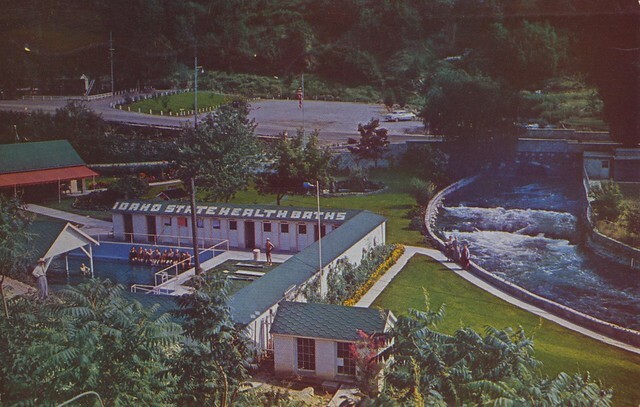 Lava Hot Springs is a large complex of pools located within the city of (you guessed it) Lava Hot Springs, Idaho. Aside from the main complex, which do not offer overnight accommodations, the city features a variety of hotels which have their own geothermal pools. The majority of hot springs hotels and lodges, which are listed here, offer free or discounted access to the main complex with purchase. So, one could stay in a hotel with a hot springs pool(s) and visit the main complex for a well-rounded geothermal getaway. The majority of hotels that have their own hot springs are within walking distance of the main complex. Picnic Area, Parking, Handicap Access, Visitor Center, Rest Rooms, Gift Shop, Food Service. Typically between $5 and 7.50 depending on if you are visiting during peak soak times (Fri-Sun). There are no on-site overnight accommodations. However, there are hotels with their own hot springs pools located within walking distance. Use the interactive Google map below for driving directions to Lava Hot Springs in Idaho. A city with it's own hot springs, named after the hot springs.